Have you ever tried to move a window to one side of the screen and instead it expands to full screen? Then when you click the upper-right corner restore button to return it to the size you set it to, it returns to the old screen position. This is the result of an annoying feature called Aero Shake. 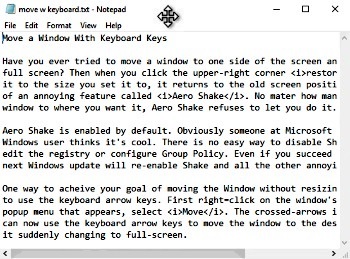 No mater how many times you drag the window to where you want it, Aero Shake refuses to let you do it. Aero Shake is enabled by default. Obviously someone at Microsoft who is not a serious Windows user thinks it's cool. There is no easy way to disable Shake. You have to either edit the registry or configure Group Policy. Even if you succeed in these methods, the next Windows update will re-enable Shake and all the other annoying Aero features. One way to acheive your goal of moving the Window without resizing it to ful screen is to use the keyboard arrow keys. First right=click on the window's title bar and in the popup menu that appears, select Move. The crossed-arrows icon will appear. You can now use the keyboard arrow keys to move the window to the desired position without it suddenly changing to full-screen. Press the [Enter] key when the move is complete.